We landed at Colombo airport just before sunset, and immediately it was obvious Sri Lanka is very different to India. Due to their proximity, the two countries have always been kind of bundled together in my mind. I was wrong. The first clue was that on the dual lane highway from the airport into the city, the cars mostly stayed in their own lanes. No one drove the wrong way, I didn’t see any animals on the road and our driver didn’t toot his horn once! The roads did get slightly more chaotic as we made our way to where we were staying, right in the middle of everything in the Fort area. We tossed our bags in our room and immediately made our way back out to get some dinner. Only a few metres up the street we came across a traditional dance blocking the way. 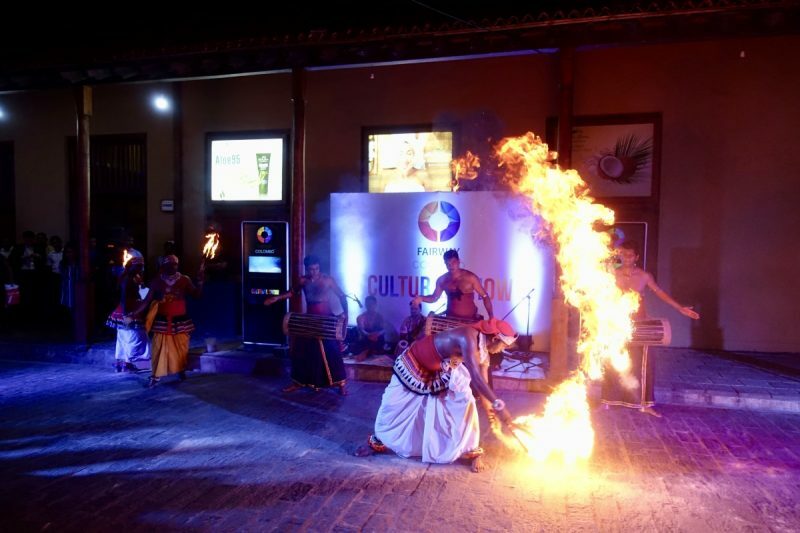 We discovered that twice a week a cutural display is held on Hospital Street, so look out for it if you happen to be in Colombo on a Monday or Thursday night. 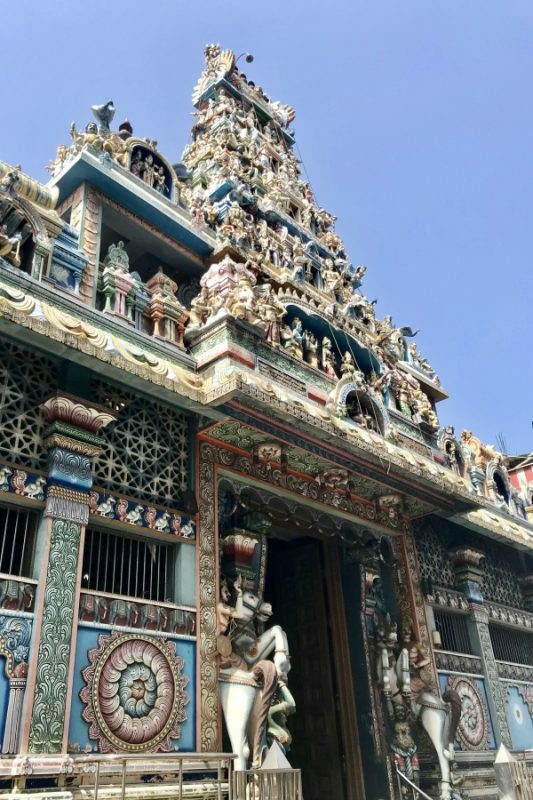 There isn’t a whole lot to attract visitors in Colombo but we had one day to have a look around. Our first task was to go to the train station and secure our train tickets to Habarana for the next day. It was only a ten minute walk up the road. We arrived to find the station all closed up. It was a little confusing though, people were milling around outside and we couldn’t see any signage. A local told us the trains were on strike and offered us a taxi – but this wouldn’t be the first time someone tried to pull that scam! I googled though, and yes, the trains in Sri Lanka were on strike! Our plan had been to travel around Sri Lanka mostly by train. Now that they were on strike, we would have to re-think how we were going to get around. While discussing our options we spent a couple of hours poking around the streets of the Pettah bazaar and surrounds. We came across the striking Red Mosque wedged in between electronics and hardware shops. I wasn’t sure if I was allowed to enter and with no one to ask we hovered around the doorway to take a few photos and moved on. A few streets further on we came across a lovely Hindu temple. I’ve since tried to find it on a map, but I can’t see it so I have no idea what it is actually called or which street it was on. One of the joys of randomly exploring an area. I really enjoyed seeing so many Christmas decorations throughout the markets. It was only two weeks away and it really wasn’t feeling like it. 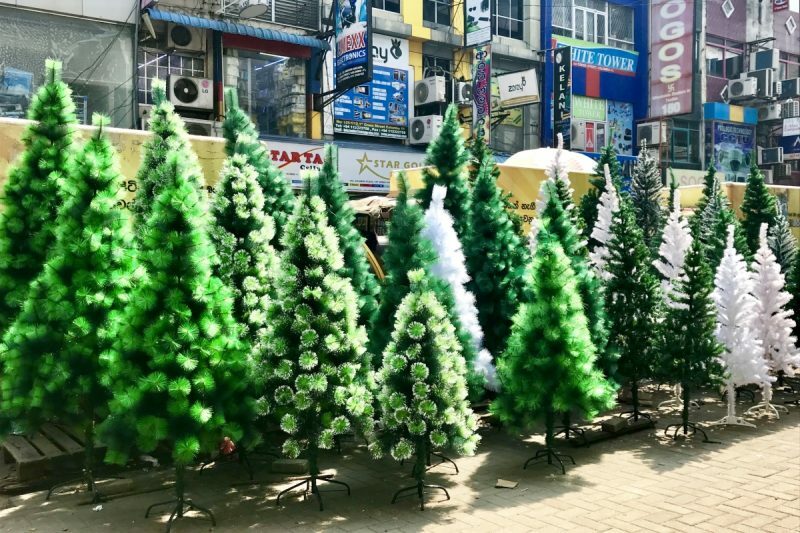 With the growing trend in Australia towards inclusiveness and political correctness, it was refreshing to see over-the-top mention of Christmas everywhere. 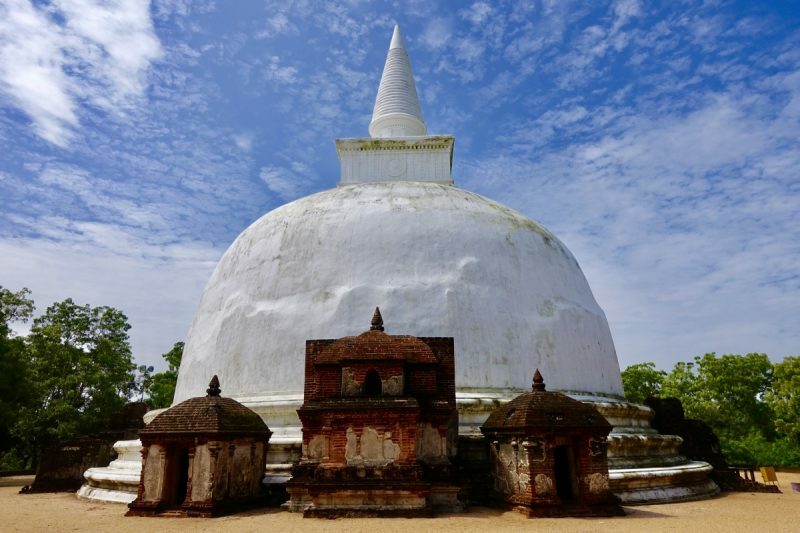 And the crazy thing – Sri Lanka is predominantly a Buddhist country, with the second most common religion being Muslim. Only eight percent of the population is Christian, but the people here celebrate and love Christmas. I am guessing it is left over from the European occupation. We eventually made our way back to where we were staying to try to figure out how we were going to get to Habarana the next day. The prices we were being given for private cars were well above what we hoped to pay, and information on the buses was vague with warnings that there was nowhere to put luggage. We aso couldn’t find timetable information for the buses. So our plan was just to walk to the bus station in the morning and find out about the buses and go from there. We arrived in Habarana to find our accommodation was in a lovely homestay right on the edge of the jungle. 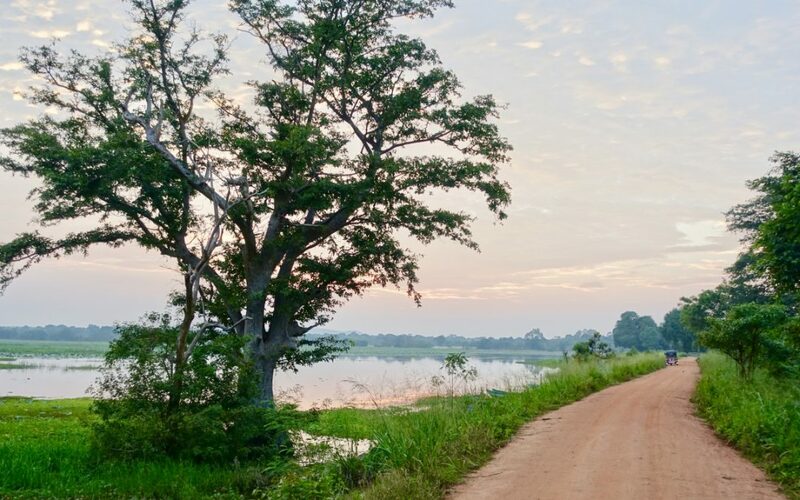 It was quiet, and we were surrounded by the sounds of nature – with a few bullock carts and tuk tuks thrown in! The people who owned the homestay could not have been more lovely. They helped us to arrange tours cheaper than we could get them on the street. Partly this was done by asking if we minded sharing with another couple, but the prices even before sharing were the best we had seen. These bullock carts are normally filled with visitors as they make their way around Habarana. All our local transport was done by tuk tuk! Part of the service from the homestay was driving us around by tuk tuk (for a small fee). Our first morning was spent visiting Sigiriya, or Lion’s Rock. This is basically a huge rock sticking out of the surrounding jungle that once had a fort built on top of it. It’s a bit of a climb to get to the top, but some lovely views on the way up and once there. 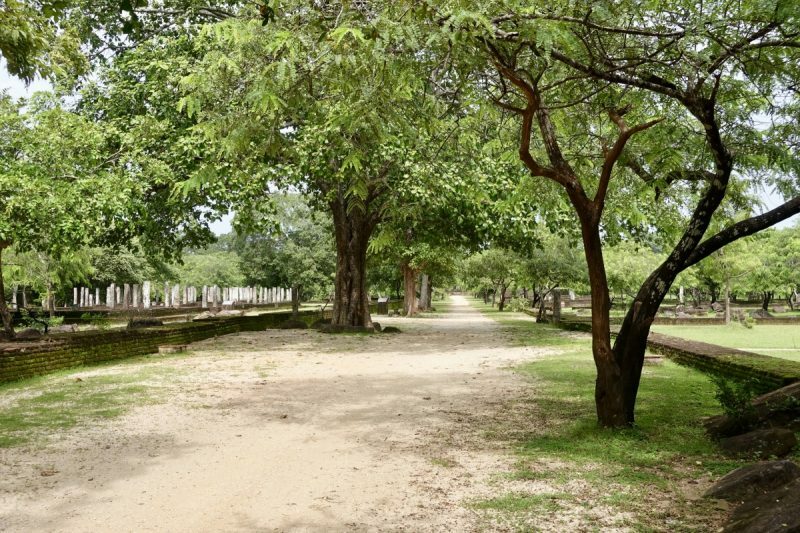 The fort and palace were built back in the 5th century and there are some significant archeological aspects to the site. 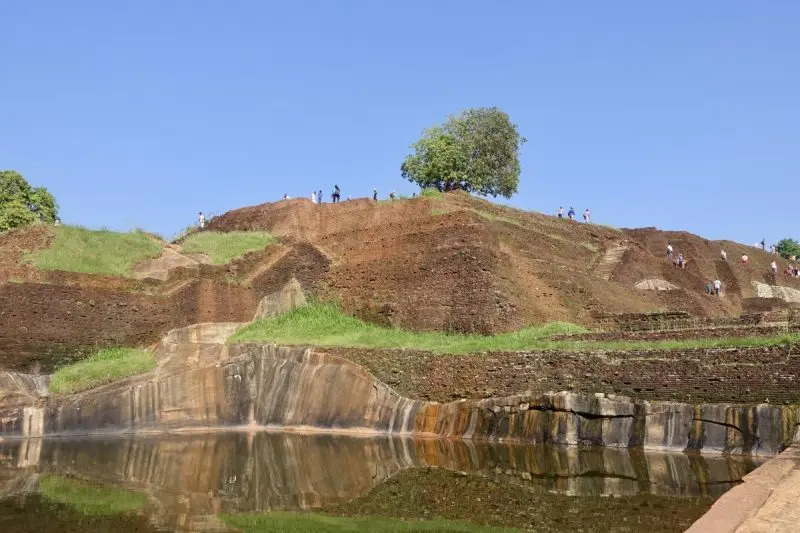 Sigiriya. That’s the rock we climbed, peeking through the morning haze. We went relatively early, arriving at about 8:00am, but I suggest getting there even earlier. Firstly, you will beat the heat. The rock is exposed with little shade so being on top in the heat of the day would be unpleasant. Secondly, if you can, you want to beat the crowds. The steps going up/down the side of the rock are single file. This means there can be quite a hold up, especially if you have been unlucky enough to arrive at the same time as the tour buses. We were okay on the way up, but by the time we came down, there were many more people trying to come up. The stairs – there are something like 1200 steps – are also steep with questionable hand rails in places requiring extra care. Near the rock is also a small museum included in the entry price. It is recommended that you look at the museum first, but we did it the other way around for the above reasons. We took longer than we expected climbing the rock, so only had a few minutes to have a quick look around the museum before meeting our tuk tuk again. Our next stop was Dambulla Cave Temple, where we were again faced with more stairs to climb – but nowhere near as many as Sigiriya. This time our climb was punctuated by monkeys and lizards and birds, taking our mind off the stairs. 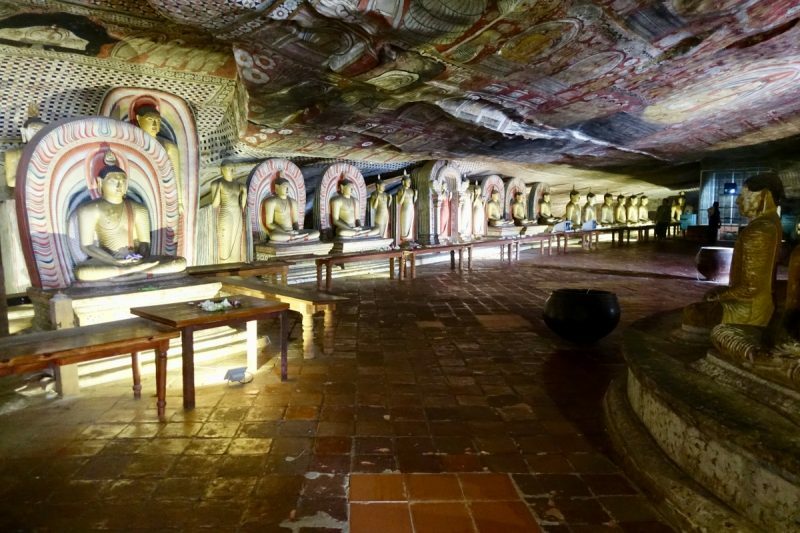 This temple is interesting as it is located in five different caves and has lots of Buddha statues ranging from large sleeping buddhas to smaller ones. As we left, our driver asked if we had seen the golden buddha. 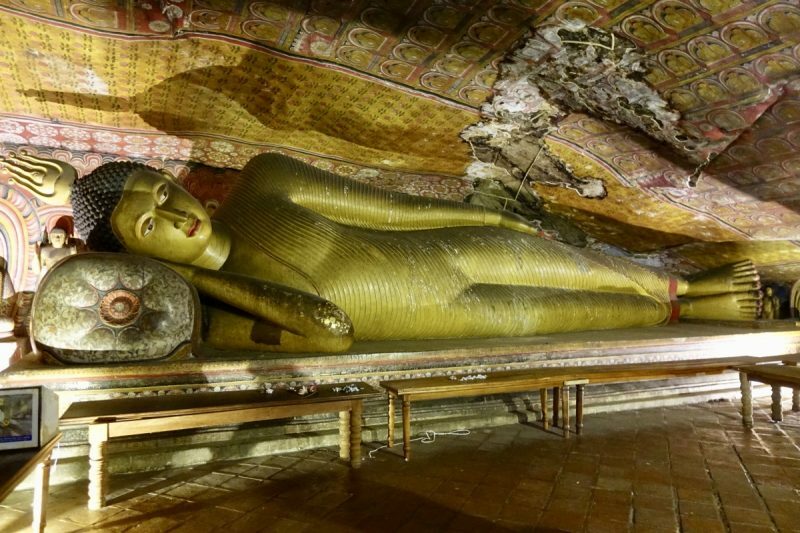 I said yes we had, because there was a large golden buddha statue in the last cave, but we discovered later that he meant a different one. There is a huge golden seated buddha statue close by that we missed. Look out for it if you visit. After a late lunch and a short rest, it was time for our safari. We were picked up in a open topped jeep and driven about half an hour to the Kaudulla National Park. Once off the main road we bumped along, spotting various wildlife such as crocodiles, and monkeys. Right alongside the road was a huge wasp nest hanging from a tree that we had to carefully drive around. The marshy areas were swarming with waterbirds, and every now and then we saw a peacock too. None of them obliged us with showing off their tail feathers though. 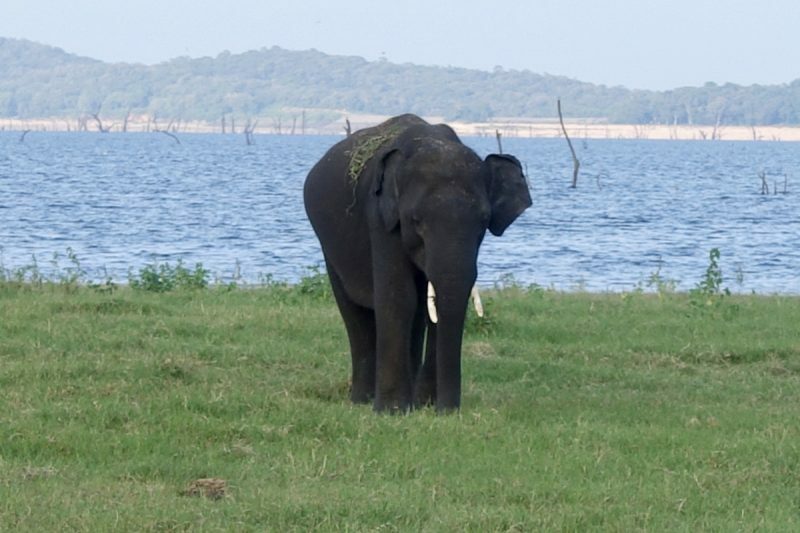 On the edge of the lake we first saw a herd of buffalo, and, finally, the reason we came – elephants! Dozens of elephants. Of all ages and sizes. All the other jeeps around us faded into the background as we were mesmerised. The elephants getting really close to the jeep in front of us. I would estimate we saw between 60 and 80 elephants often within 25 metres of our vehicle. There were more in the distance too. I had heard reports of some people seeing up to 200 up close, so it is possible to see many more than we did. 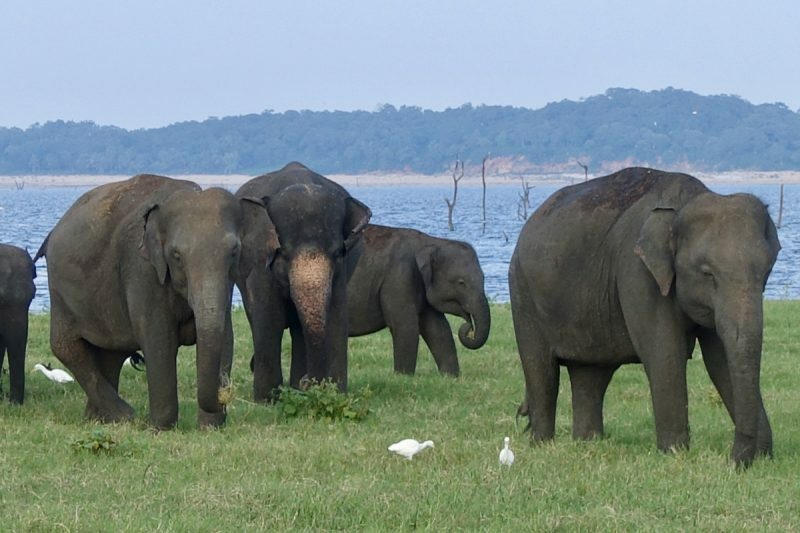 There are approxiately 300 elephants in the region, and they move between three national parks, Kaudulla, Minneriya and Wasgamuwa. 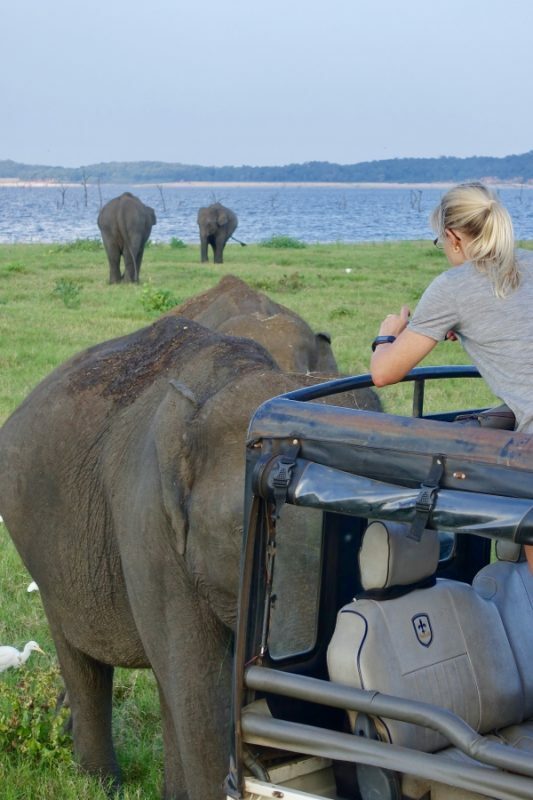 The locals will always be able to give you tips as to where the elephants are at any given time. While elephants are the main attraction, there are also some other large mammals you may come across. There are deer, leopards, wild boar, and even sloth bears hiding in the trees. I didn’t hear of anyone seeing these during our travels, but you may be lucky! 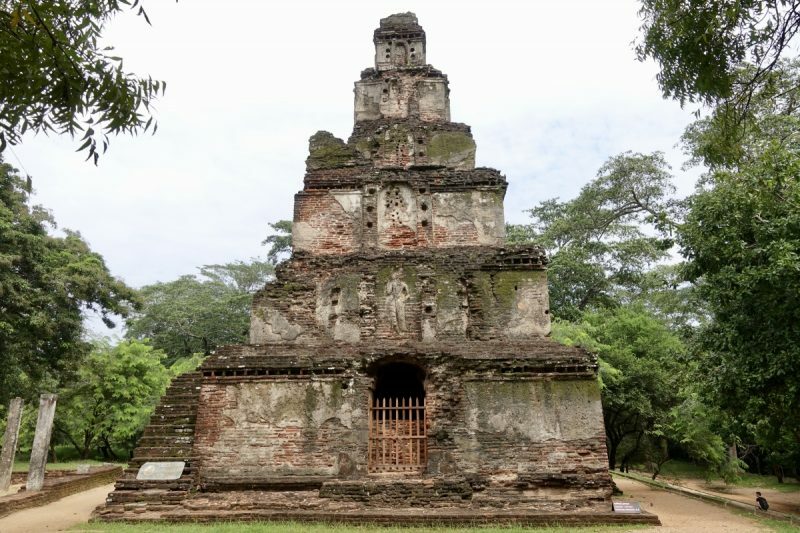 The next day we again hired the jeep and paired up with the other couple in at our homestay to visit the ancient city of Polonnaruwa. 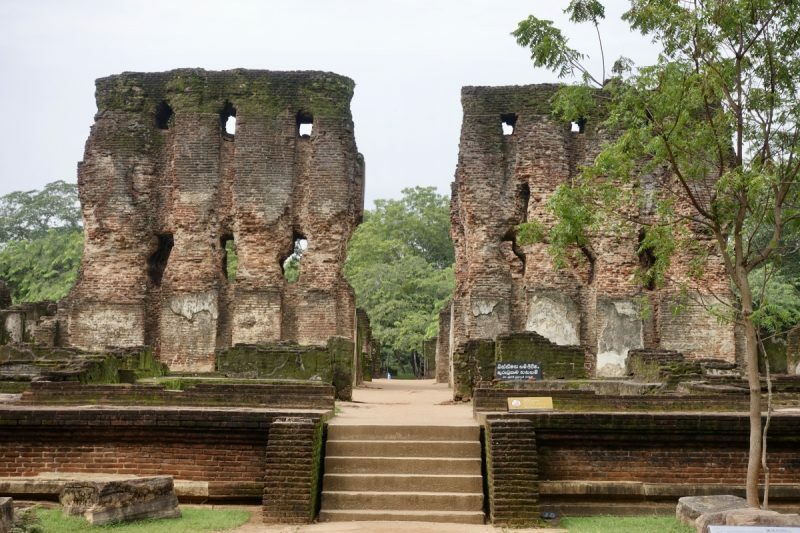 This city was built over a thousand years ago when it became the capital of the Kingdom of Polonnaruwa. 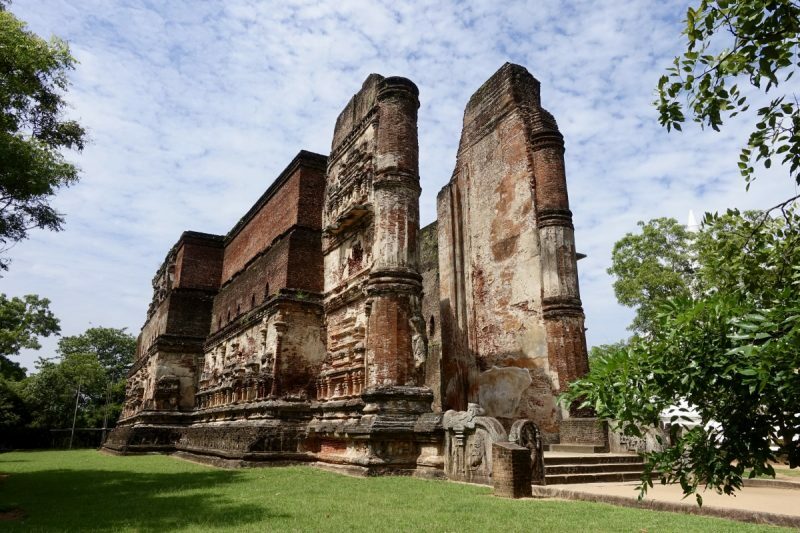 Now it is UNESCO heritage listed and the ruins spread over a huge area. Most people who visit hire a bicycle and ride between the different areas. We already had our driver, so rather than ride, we took advantage of the car between the sites. Right at the entrance is a museum that shows off some of the artifacts and talks about the history of the city. We spent about half an hour wandering through here to get an idea about what we would see. From there it was onto the ruins. The first stop was the Royal Palace, which was originally seven stories tall. 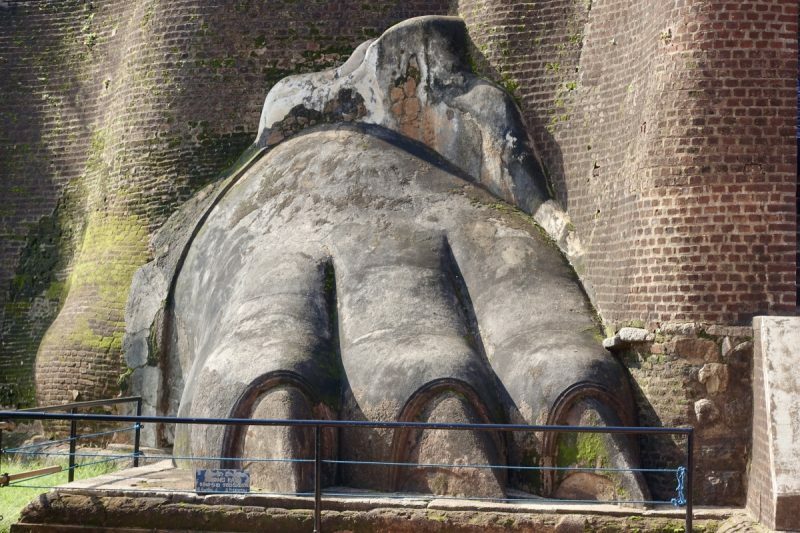 Pretty amazing for a thousand year old building! There were literally hundreds of different buildings with different purposes throughout the area. I could talk about many of them, but instead I will just share a few photos of my favourites with some info below. 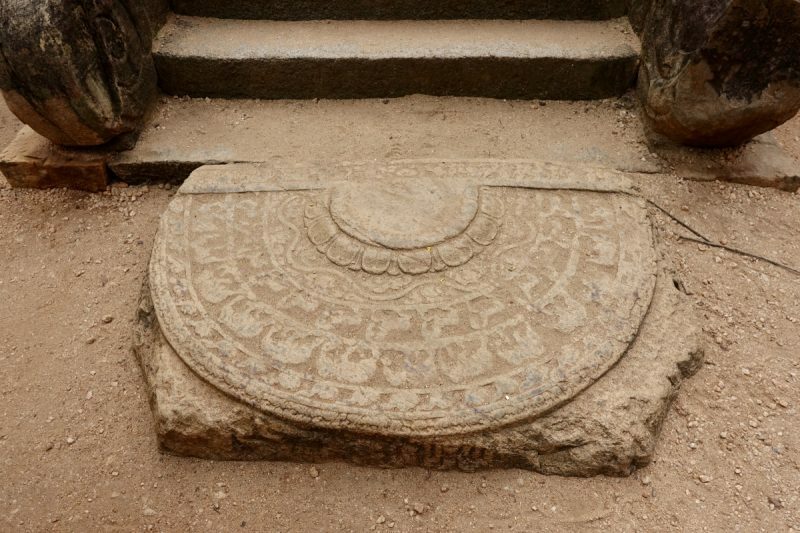 This cathederal-like Lankathilaka ruin has a huge Buddha inside. It was also one of the few places with a group of visitors. I had planned to return as we walked back to capture the inside – and completed forgot. The white stupa. Many of the other buildings were originally covered in this white coating too. We spent much of the day wandering around the area. I enjoyed that it was set amongst lots of trees and was green and peaceful. There was also plenty of wildlife, like monkeys and water monitors, around to entertain us too. Most of the time there were only a few other visitors so it didn’t feel crowded or rushed and we really could explore as much as we wanted. Mostly the area was empty. We explored the monastery all by ourselves. 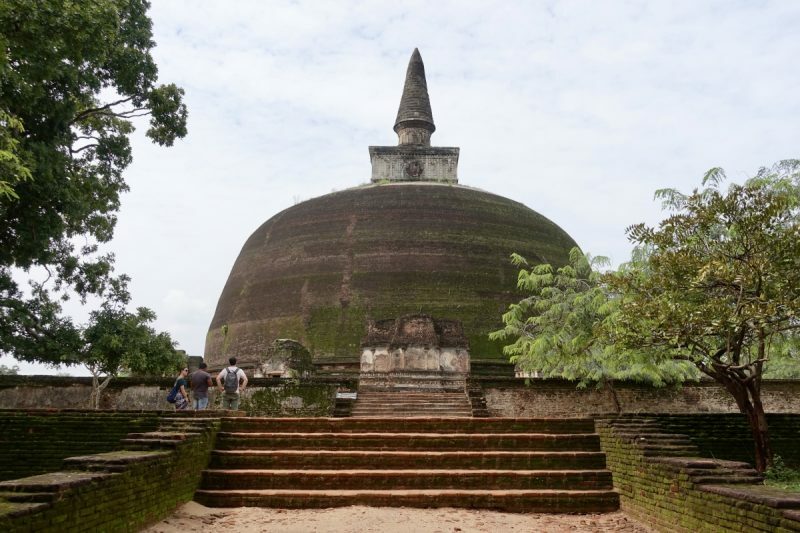 Unfortunately we somehow managed to miss one of the more well known areas – Gal Vihara. Here are four large Buddhas carved into the rock. I had seen information on them in the museum, but completely forgot about them until Simon mentioned that night we hadn’t seen them. I’m not exactly sure where we went wrong, but I have a suspicion we turned right at a certain point but should have gone left first to see this area. I guess this is one of the downfalls of not having piles of other visitors to follow in the correct direction. It was moving time again, and still the trains weren’t running. Our housemates were also on their way to Kandy, so we all decided to be brave and take the bus. It is 94km between the two towns, and the bus took us two and a half hours. This bus was even more interesting than the buses in India. The buses here are getting closer to the chicken buses I associate mostly with South America. 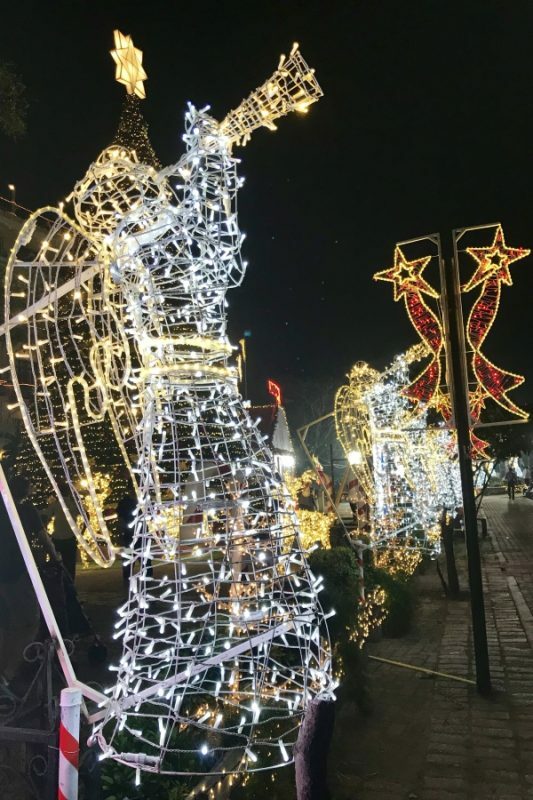 They are old and brightly decorated with flashing lights and anything that is over the top! They barely stop when people get on and off, and everyone is squished in a little closer than is comfortable. The other three were sitting on the back seat, but I was standing in the aisle. I may have been the one standing, but I think I got the better deal. I was right near the rear door which was left open the whole trip, meaning I had a nice cooling breeze. 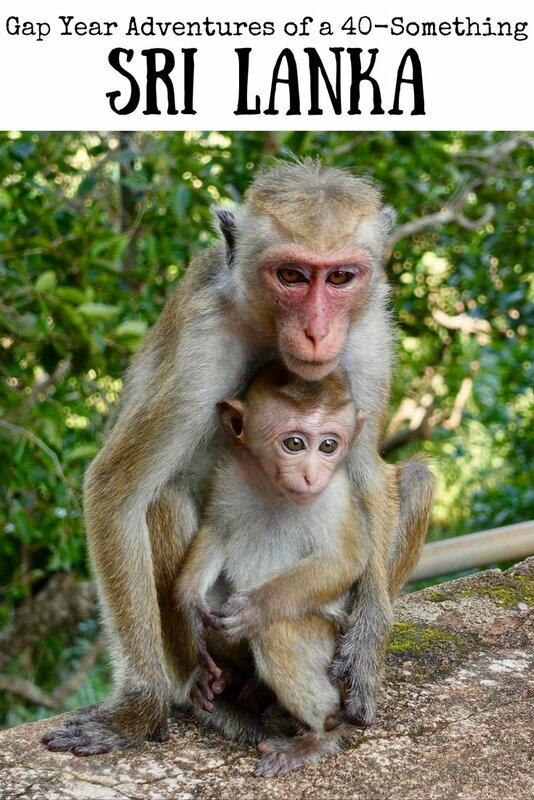 On arrival in Kandy we said goodbye to our new friends. While we were heading in the same direction, we were staying in Kandy for three nights while they were only staying for one before moving on. We checked in to our hotel and found something we hadn’t come across anywhere else in Sri Lanka – wifi that was a reasonable speed and didn’t drop out! This was a great opportunity to rest up a bit after a couple of busy, hot days while backing up all our photos and catching up on the blog. Sometimes just a few hours of downtime is all that is needed to be ready and raring to go again. We arranged a tuk tuk driver for the next day to show us around the sights of Kandy. 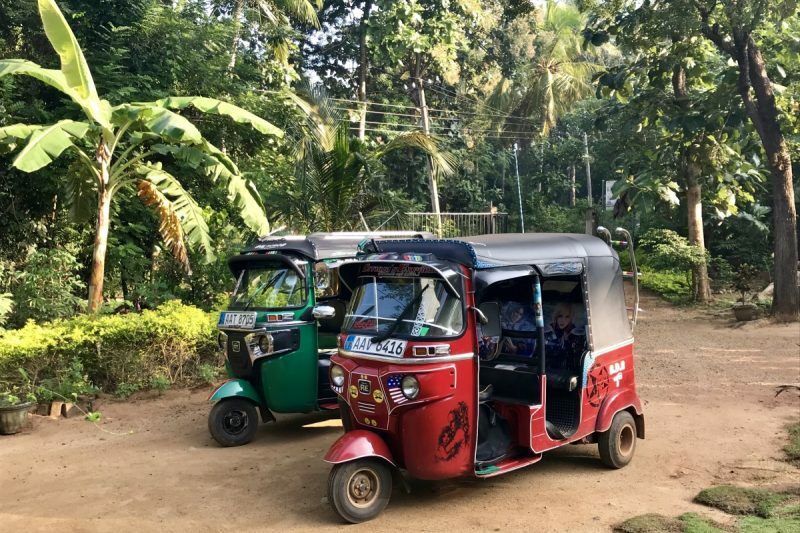 It was incredibly cheap to have our own tuk tuk for the day – 1300LKR ($11AUD/$8USD) – so do not hesitate to take up this option. The other “cost” of the day was that our driver took us to a few places that were clearly designed to get us to spend money. The first stop was a tea factory, which we did want to see. We learnt about the tea making process and got to try one of the most popular teas. I was surprised to learn that black, white and green tea all use the leaves from the same bush, it’s just the processing that is different. We next stopped at a gemstone museum, and were shown all sorts of gemstones and taught about the process of them being made. I learnt that Sri Lanka has a lot of natural resources that produce various gemstones. Of course at the end of the tour we were lead to a showroom with some lovely jewellery for sale. I was glad to find the salesman was not pushy and was happy to engage in some banter about the cricket rivallry between Sri Lanka and Australia. Talking about cricket, it was around now on our tour that Simon got talking to our driver about cricket. 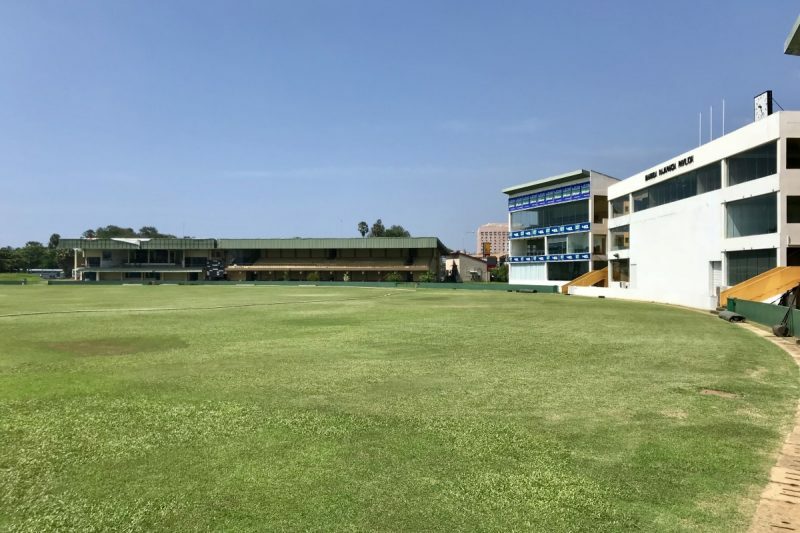 You are probably aware that the Sri Lankans are crazy about the sport, and it was almost the first thing that came up every time someone found out we were Australians. Anyway, Simon mentioned he had tossed the coin at a World Cup match a couple of years ago and showed him photos of himself with the two captains. We suddenly became royalty! Our driver couldn’t do enough for us, and every time we stopped he talked madly to the people at the location to tell them about Simon’s brush with fame. I found it all a bit too much, but Simon was lapping up the attention. 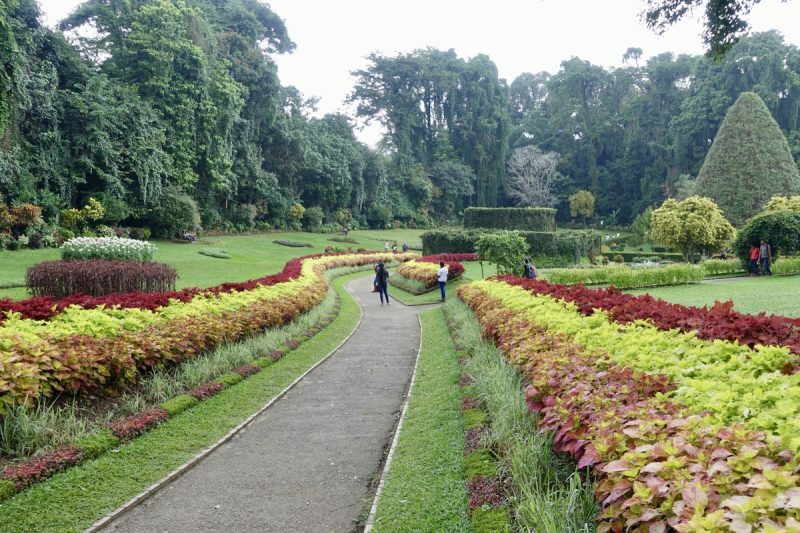 After another stop at a mosaic factory, we made our way to the Kandy Botanical Gardens. 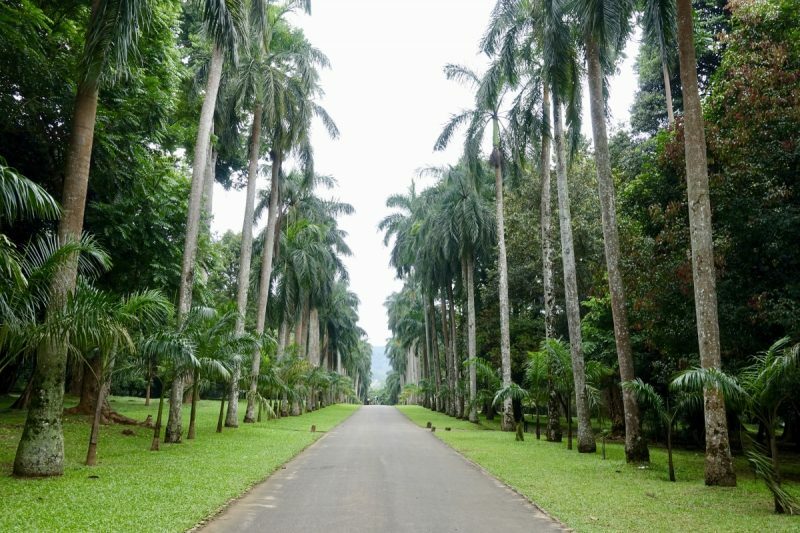 Kandy is a busy city, so it was nice to spend an hour walking around the gardens. We came across some really unusual trees I had never heard of before. We also ran into our friends from Habarana again. They were relaxing in the gardens while waiting for their bus out of town. The gardens are mostly about trees not flowers but this section was bursting with colour. 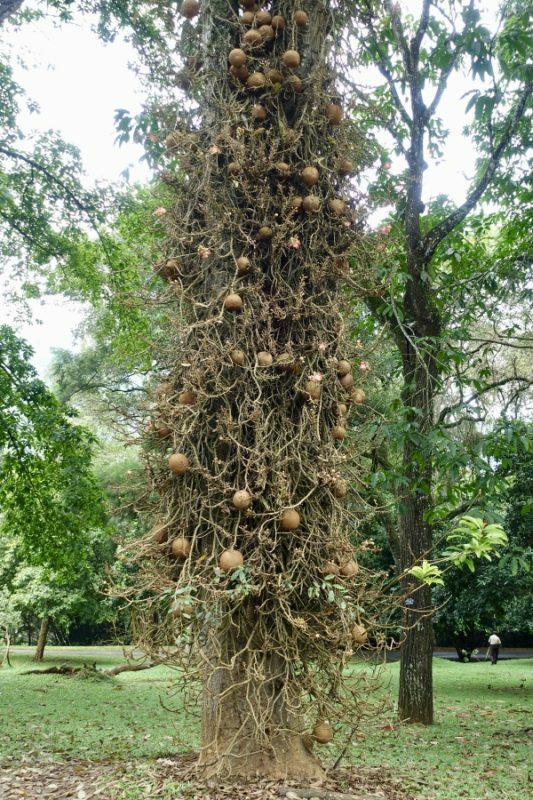 I had never heard of a cannonball tree let alone seen one! Those fruits are about 25cm across. During our visit to the Botanic Gardens the sky got very grey. As we were driving to the big Buddha on the hill above Kandy, a few spots of rain fell. As soon as we had made our way up to the Buddha, the heavens opened and it absolutely poured. Being the tropics, it only lasted about fifteen minutes, but we were impatient and only waited about twelve minutes before deciding to make a dash back down to the tuk tuk. We splashed through the puddles barefooted, picking up our shoes at the gate on the way out. (Being a temple we had to leave them at the front gate) Needless to say we got soaked, and as soon as we were comfortable in the tuk tuk, the rain stopped! 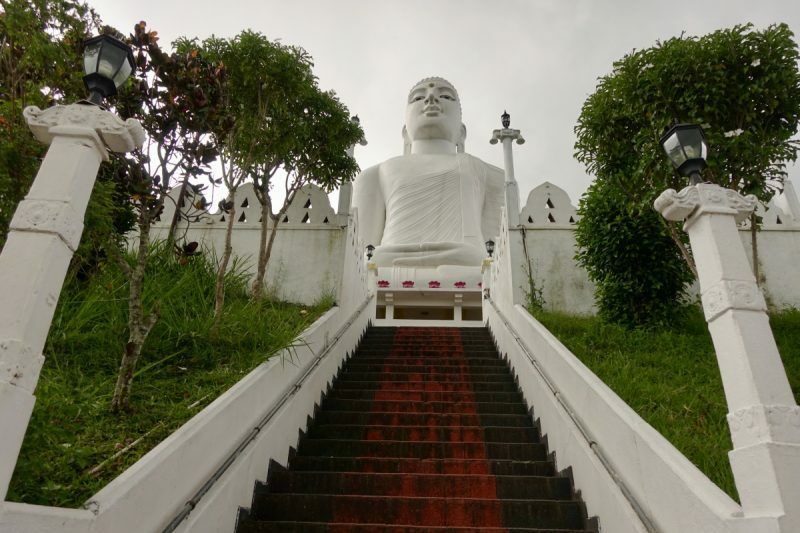 The huge Buddha on top of the hill – only minutes before the downpour started. Our driver wanted to take us for a massage next, but we weren’t keen. 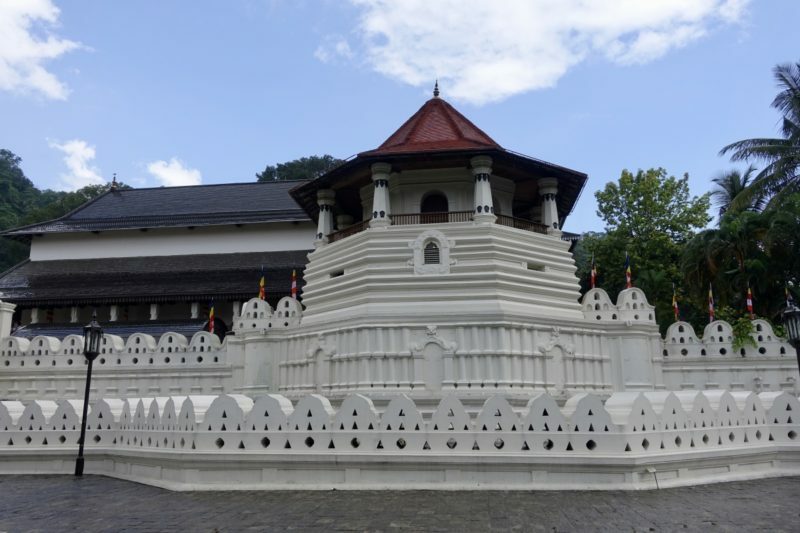 It took a little convincing, but he finally agreed to drop us off at Kandy’s best known attraction – the Temple of the Sacred Tooth Relic. 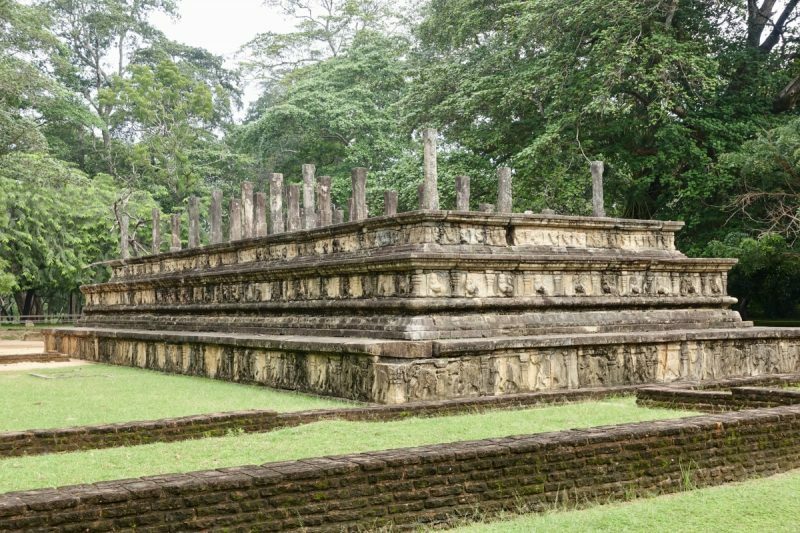 We spent the rest of the afternoon looking through the temple, it’s associated museum, the Kandy Museum and the International Buddhist Museum. All were vaguely interesting, but none overwhelmingly so. As we walked through the temple there was such a crowd of people I felt almost like we were on a conveyor, and didn’t realise we were looking at the box containing the relic until we were past it. Our second day in Kandy was another quiet one. We started with a walk along the edge of the lake, eventually making our way to the train station to see if the trains were running yet. They weren’t running, but we were told they would be in the morning, and to come back then to get a ticket. Yay! Finally we were going to catch a Sri Lankan train, and just in time too! After a quick lunch we went to check out Helga’s Folly. 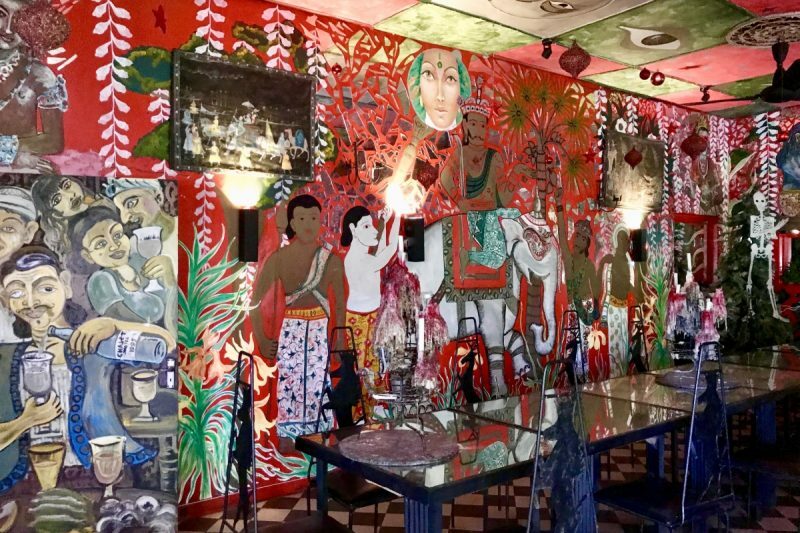 I had heard about this place online – it’s actually a hotel – but it’s also good to drop by for a drink like we did, or a meal later in the day. This place really has to been seen to be believed. Every way you look there is something colourful and quirky to see. Even though we were sitting downstairs, I roamed through the whole place having a look with no one stopping me. The next morning we were up early to get our train tickets on the famed Kandy to Ella train. 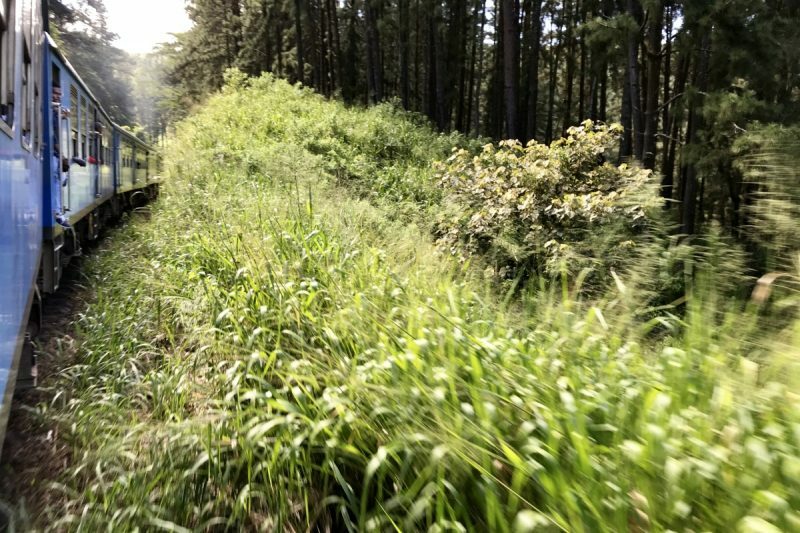 This trip is often slated as one of the most beautiful train rides in the world and we were so excited that the trains were running just in time for us to do it. So, it seems, were the thousands of others lined up on the platform waiting. Clearly people had been waiting in Kandy for the train strike to be over before moving on to Ella. 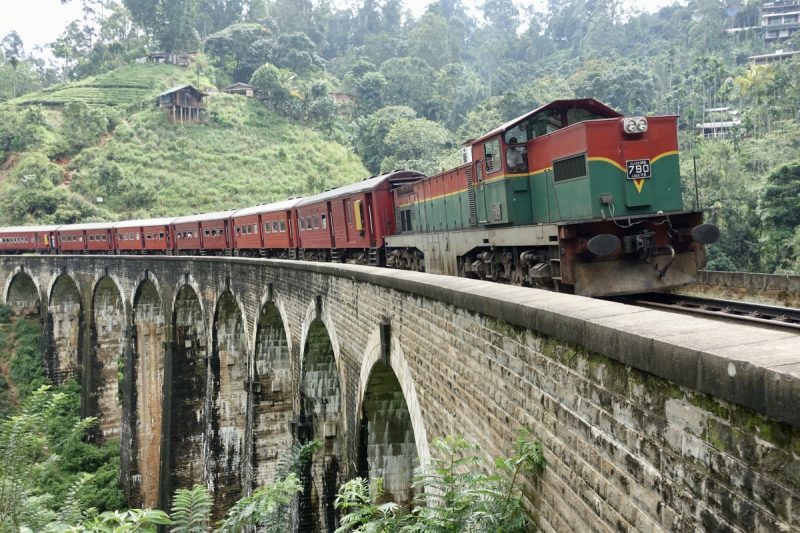 This train originates from Colombo, and the locals have figured out that they need to get on before Kandy. I’m not sure where the preceeding stop is, but if it’s not too far, I would try to go there and meet this train. You might stand a chance of getting a seat that way. Once we boarded it was jam-packed. Even though we were standing, we were amongst the lucky ones who at least found space for our luggage. I was able to jam mine into one of the overhead racks, and one of the locals was kind enough to have Simon’s backpack in his leg space. Those that had their luggage in the aisle with them had to move it every few minutes as vendors moved up and down the train selling food, drinks, trinkets and souvenirs – anything they could really. Simon ended up standing the whole seven hours to Ella. I squeezed through the crowd at one point and sat at a coveted doorway location for a short amount of time, then eventually was lucky enough to get a seat when someone else moved. From what I could see from the aisle, then the doorway and finally the seat, yes, it’s a pretty train trip. We had an overcast day with a few spots of rain along the trip (even though it was still hot inside the train). I can imagine how stunning the landscape would look bathed in sunshine on a perfect day. Ella is high up in the hills and the change in temperature was immediately noticeable. We loved the atmosphere of the town as soon as we arrived. It’s quite chilled out, and although the main street looks touristy, it’s the kind of touristy I like. 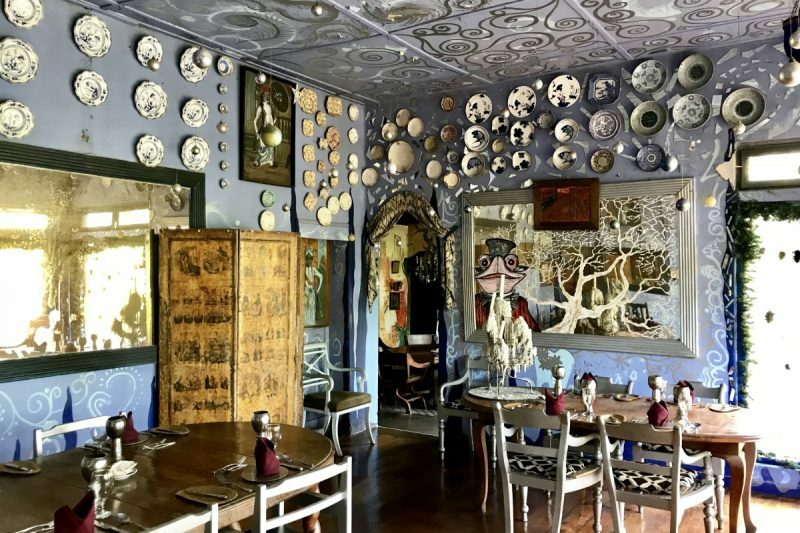 Not big hotels full of tour groups, but smaller backpackers haunts and local cafes and bars. We were staying right in the centre of town which was an ideal location. We had one full day to explore Ella, so we were up before the sun to hike up to Little Adam’s Peak. Unfortunately the morning was cold, damp and foggy, so there was not really a sunrise to speak of, everything just got lighter. On our way up we again ran into our friends from Habarana! Seeing them in Kandy was coincidence, we now joked around that this was starting to get creepy! 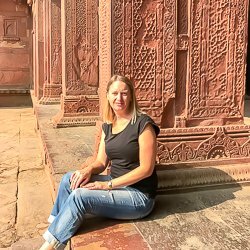 After this though our paths would not cross again – unless our flight was delayed as we left Sri Lanka and we were still at the airport a few hours later when they would arrive to catch their flight home to Germany on the same day! While I would be happy to see them again, I was hoping that it wouldn’t happen! Too many plans for that flight to be delayed! We made our way back to town after Little Adam’s peak – it was less than an hour each way from the top to the centre of town, so a nice and not too challenging walk. Breakfast was served at our homestay, then we retraced our footsteps out of town to visit the Nine Arches Bridge. This bridge was built in 1921 when Sri Lanka was still a British colony. It is in a picturesque jungle area and the hike there and back is the perfect way to spend a couple of hours. Try to time your visit with a train going over the bridge to get some iconic photographs that look like you have stepped back in time. We saw a train at 10:50am, and we heard another one pass as we were making our way there about 9:30am, but it’s probably best to ask at your accomodation for the latest times. When there are no trains, it is perfectly acceptable to walk across the bridge to explore. At one end there is also a short tunnel that we walked through. This would be way off limits in Australia, so it was a bit of a novelty to walk through a tunnel that a train could come through at any minute. When the train did come we were surprised to see that some brave (stupid???) people stayed on the bridge as the train went past. There must have only been inches between them and the train. Not something I would have tried. Back in town we hired a tuk tuk to take us out to see the Ravana Falls. 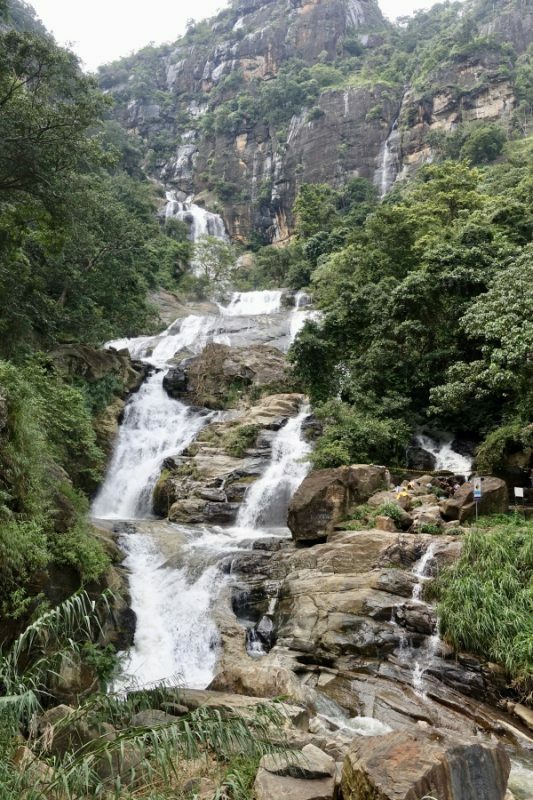 This 25m waterfall is a few kilometres out of Ella. It is possible to take a local bus to Ravana Falls too for only a few cents. I’m sure they would be fairly regular, but the best bet again is to ask around. Not only are the waterfalls nice to look at, it is fun to watch the locals play and bathe in the edge of the falls. It was too cold for me, but feel free to join the locals under the waterfalls if you want to. Ravana Falls. The locals were swimming and bathing in the small area on the right. For our next leg train was not an option unless we wanted to backtrack and spend all day and half of the next getting there. After again chatting to many of the locals to find out the price of a car to Galle, we decided to go with the cheaper option. “Just go down the street and there will be buses, one of them will take you” was the recommendation. 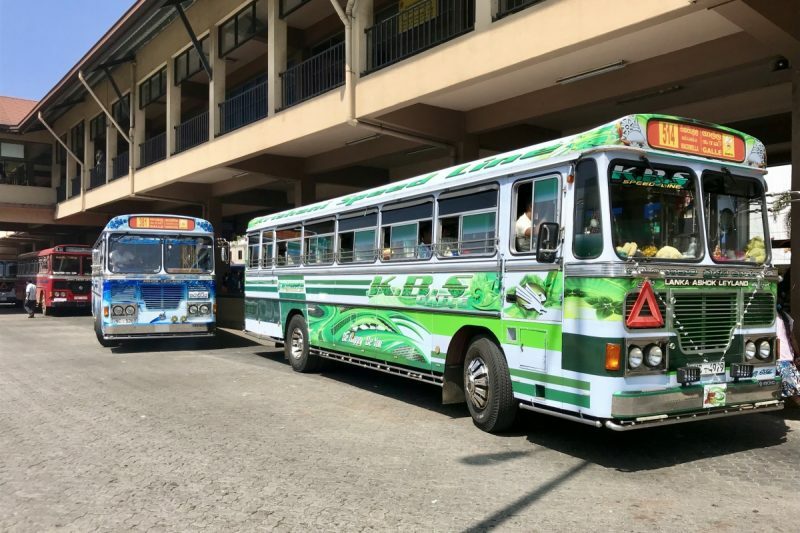 We got there and asked for the Galle bus – and were quickly herded on to one going to Matara! 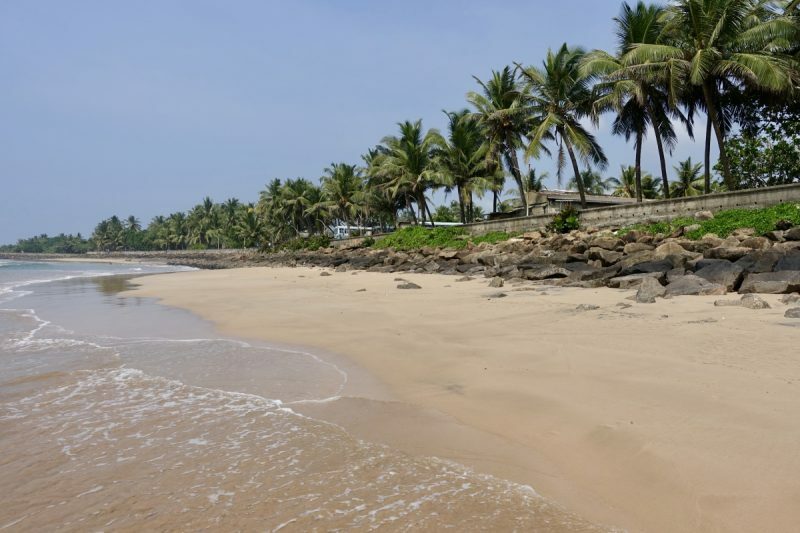 Clearly this was not Galle, but I knew that Matara was along the coast from Galle, and the train ran between them so I figured we would at least be close. The next five hours were some of the craziest, most uncomfortable, loudest and most interesting of my life. This was a real chicken bus experience. 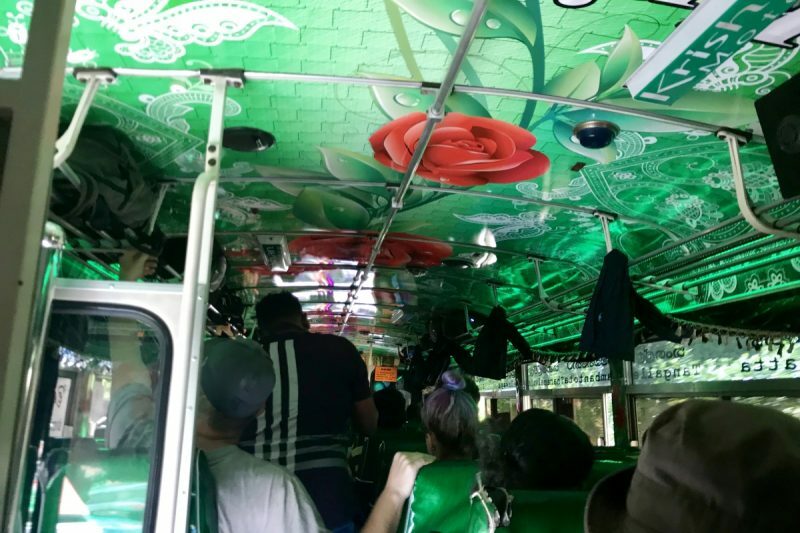 The inside of the bus was bright green with bold pictures covering the roof and every other surface. There were flashing lights everywhere that came on when the bus braked. That wasn’t often though, the driver preferred to drive by the creedo of “I’m bigger than you, get out of my way” rather than use the brakes. 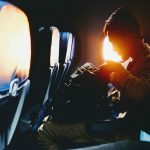 Corners were merely an irritation and were not a reason to slow down so we were thrown back and forth – most of the time only as far as the person next to us would allow as were we jammed six across on the back seat. Local Sri Lankan music was played at top volume for the whole trip and getting on and off was done from the open back door with the bus still rolling. We got off covered with dust and sweat, glad we had made it and chalking up the new experience. The whole trip had cost us 492LKR each ($4AUD/$3USD) – there are not too many five hour bus trips cheaper than that! We swapped to another local bus heading to Galle for 70SLR ($0.55AUD/$0.45USD) to travel the last hour into Galle. I really liked the location where we stayed in Galle. It was a couple of kilometres from the popular fort area so we had to get a tuk tuk each way, but it was on the edge of the forest, near a lake with nature around us. There were always monkeys, squirrels, lizards and other animals and birds around. We were sitting at breakfast on the front porch one morning and a three-foot long water monitor came down from the roof and waddled away. That explained the noises we had beeen hearing in the ceiling! Galle was hot! I’m not sure if we felt it more because we had just spent a few cooler days in Ella. 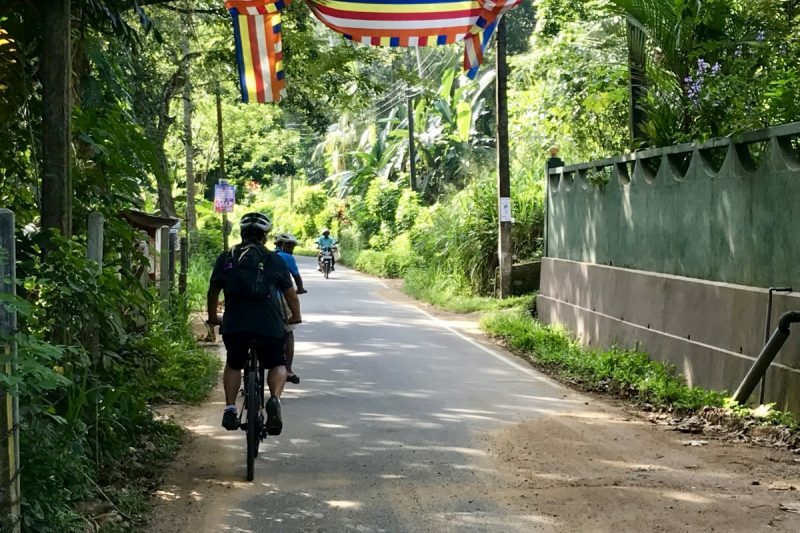 We had arranged to do a bike tour through the countryside with Sri Lanka Cycling Tours and even though we started at 8am, by the time we finished at 10am I was completely exhausted. The tour was fabulous though. We cycled down backroads and through rice fields, watching the locals go about their daily lives. Again we spent our time spotting the wildlife, from the pretty blue kingfishers to the huge water monitor that I swear was bigger than me! 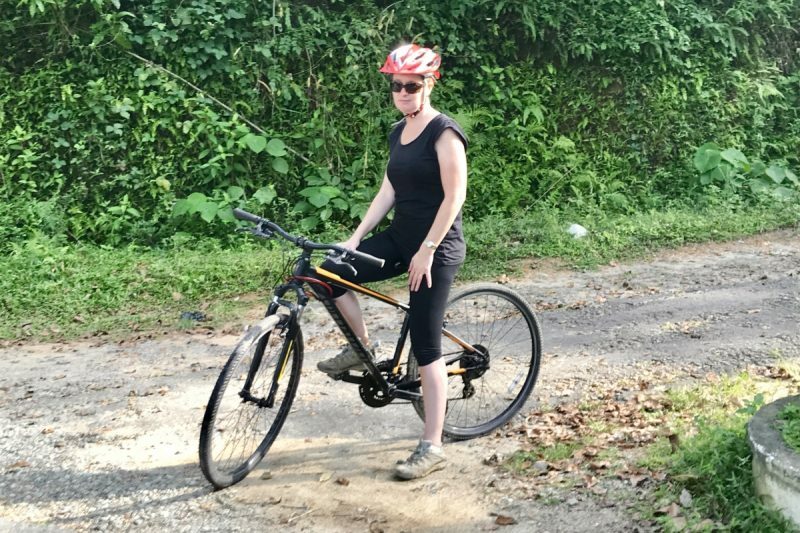 I am by no means a bike rider of any kind, and while there were a few hills and I had to get my head around the gears on the bike, it was not too challenging for me. 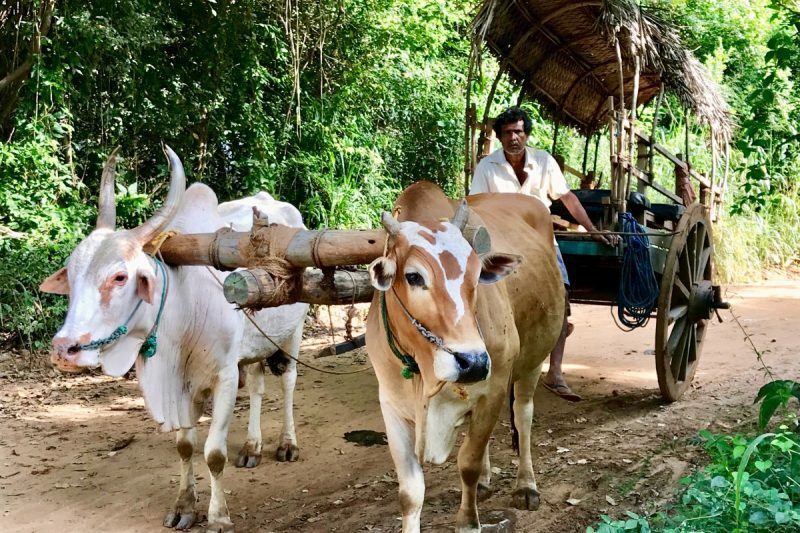 I loved how we were able to get out of the cities and truely enjoy the countryside in Sri Lanka. I think if I could do it all again I would try a longer, slower, bike tour as I enjoyed it a lot. It was a peaceful way to explore without the noise and traffic. 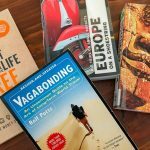 I might even get game and try a multi-day trip – and make sure I hit the gym beforehand to acclimatise my legs! 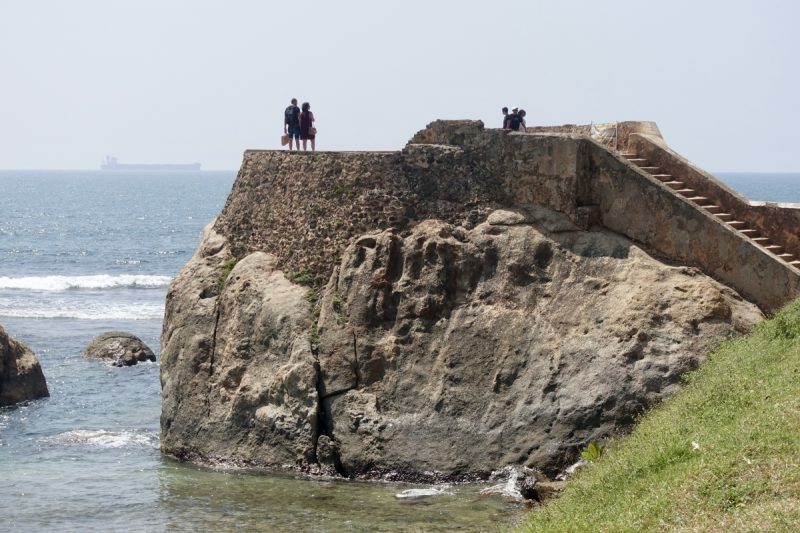 Back in Galle itself we explored the fort area. This area has a very different feel to it than the rest of the city. The European influence is clear. I can see why most people stay in this area as it is very touristy – but not necessarily in a bad way. 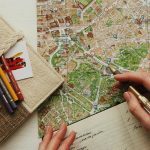 There are lots of small boutique hotels and some great traditional places to eat. We tried out Coconut Sambal (see our review here) and Lucky Fort Restaurant, both of which were reasonably priced with delicious Sri Lankan food. 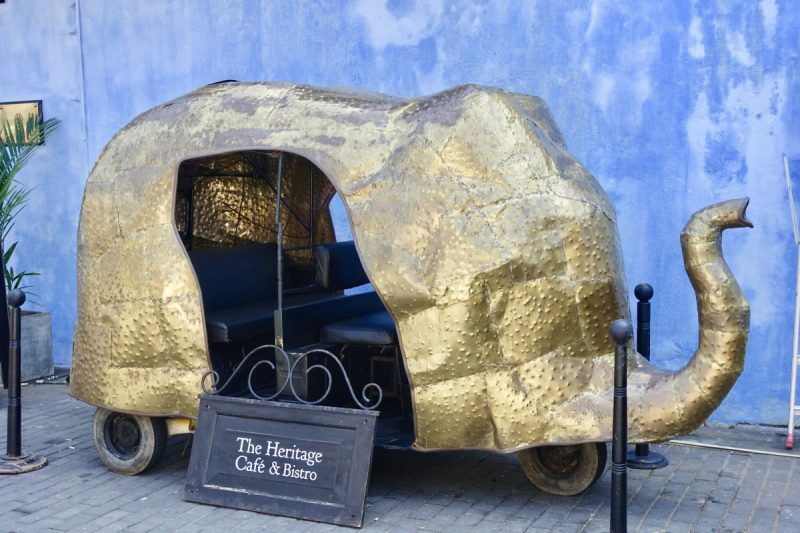 Loved this elephant tuk tuk in the centre of Galle. A walk around the UNESCO world hertiage liisted fort would not be complete without checking out the lighthouse and the seawall. We walked around the wall taking in the views out to the ocean and the locals using the grassy areas for their favourite pasttime – cricket! Talking about cricket (yes, again, it’s come up a lot in this post!) outside of the gates of Galle Fort is the Galle International Cricket ground. Simon had to have a glimpse of this ground he has previously seen on television during games. I was surprised that it has much more of a local feel to it than what I was expecting from an international ground. I just wonder how many cricket-mad fans can fit in here during the big matches. We also did a quick visit to a spice farm – which was designed to sell us herbal medicines – and took a walk along the beachfront. This area is obviously not one popular with swimmers as the waves were pounding into the shore, but the water was lovely and warm and would have been perfect for me if I had planned to swim. 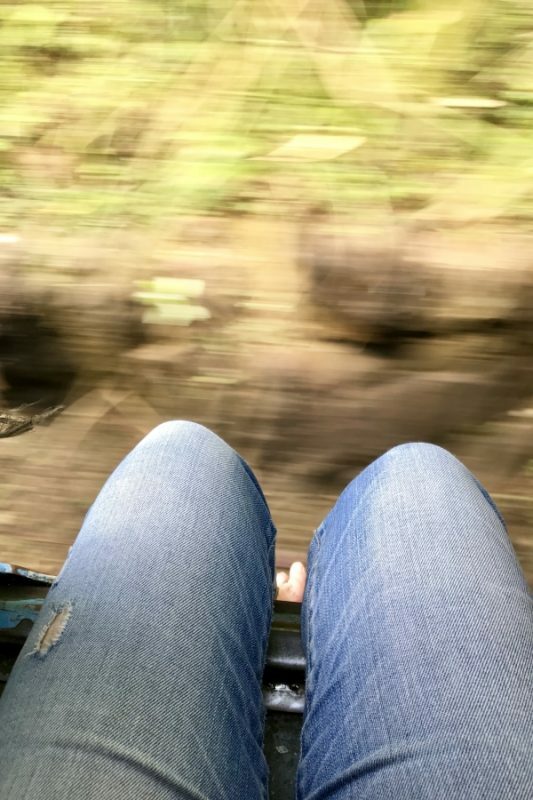 There was still one last train trip before our Sri Lankan adventures were over, this time from Galle to Colombo. 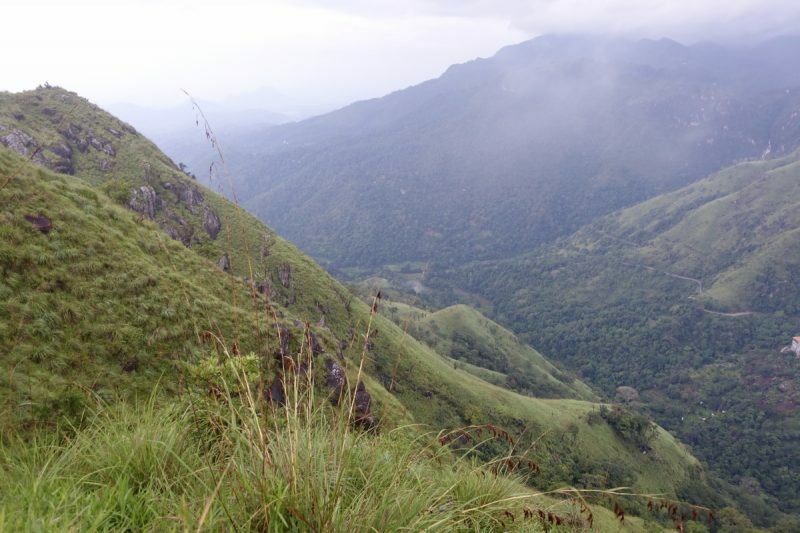 While the trip from Kandy to Ella is often raved about, I think this one is pretty good too. For much of the trip the train goes right along the seafront with great sea views. 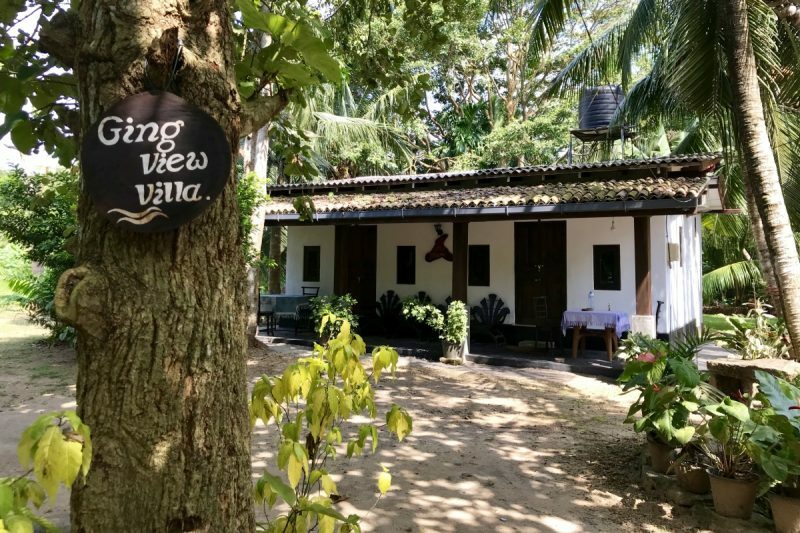 The other side has views of rural life and jungle scenery. This train was still busy with people standing in the aisle for most of the trip, luggage everywhere and the constant stream of local vendors. Rather than stay in Colombo itself, we got on another bus up to Negombo and stayed there. It is closer to the airport, and made our journey there in the morning shorter for our flight out. I really enjoyed Sri Lanka, and can definitely see myself returning again in the future. I loved how green everything was and that feeling of being in the countryside rather than the big city. 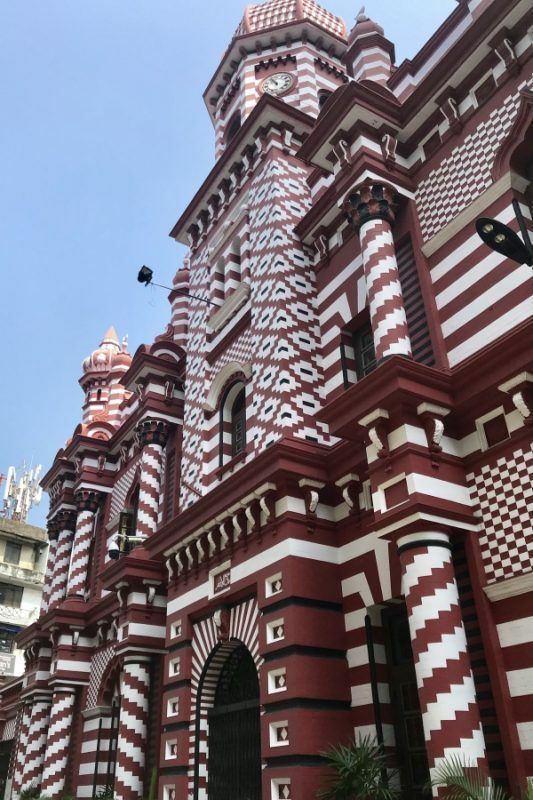 If you are visiting don’t bother spending much time in Colombo, get out there and enjoy the rest of the island. While we did the trip on a budget, there are some amazing luxury resorts here too and my plan for our next visit is to take advance of at least one of these, but the big question is – should I choose the beach or the jungle?? I have mixed feelings about the transport. It really was everywhere and easy to use – once we figured out what we were doing, which was a bit more difficult. The train strike did not help us at all. In the grand scheme of things, private drivers are relatively cheap compared to western countries, but they were exponentially more expensive than public transport. They are also no quicker than the buses – probably because they drive in a more subdued fashion than the crazy bus drivers! Tuk tuks are great to get around the towns, just work out what the right price is by asking around and stick to it. 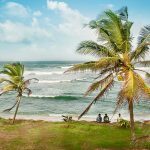 Overall Sri Lanka is a cheap country to travel in. We could get a meal for two including an alcoholic drink each for less than $20AUD ($16USD). We took advantage of the lower prices to stay mostly at places that were slightly more luxurious. and central rather than save on the budget. One thing I did find unusually expensive was entry into some of the attractions. Everywhere has a huge difference between what the locals pay and what foreigners pay. 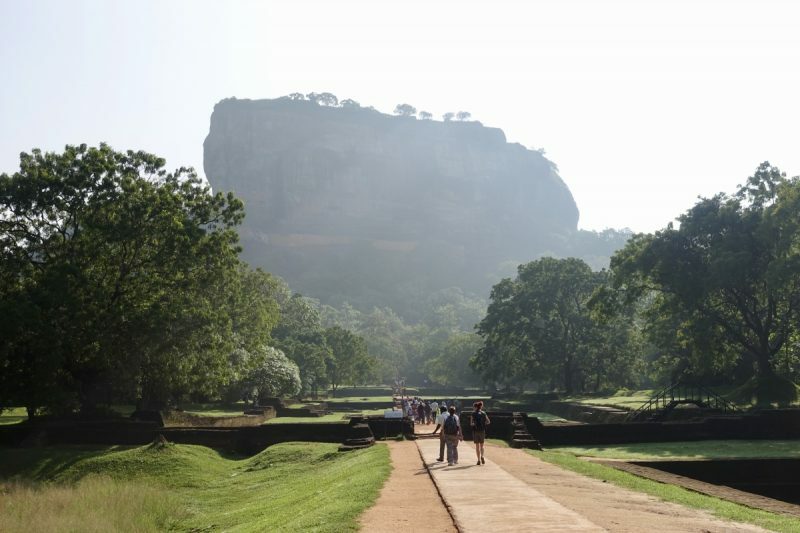 Sigiriya for example is 4850LKR ($40AUD/$32USD) for a foreigner and for a local, 100LKR! 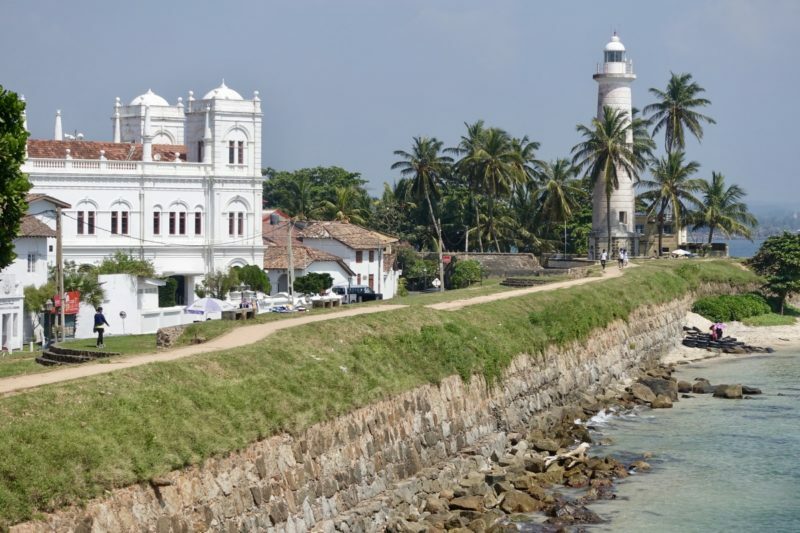 Our bicycle tour in Galle was though Sri Lanka Cycling Tours. 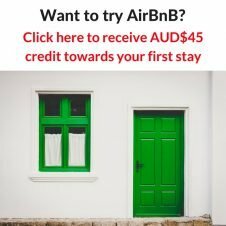 Click through to their site to see all the options they have available and book your own tour to enjoy this slice of paradise. It was nice reading about your experiences in Sri Lanka. Lovely photos too. This sounds like an epic adventure! Thanks Hannah, it was great! Makes me want to go back for more evry time I think about it.